Summary and Definition: The Ponca people were originally a small woodlands tribe of farmers who lived in longhouse villages inhabiting areas in present-day Ohio. They migrated to the Great Plains to hunt buffalo and inhabited lands along the Niobrara River on the boundary between South Dakota and Nebraska. The above picture depicts the eighteen year son of a Ponca Native Indian called Hongs-kay-dee, meaning Great Chief who was the son of Chief Smoke. It was painted in 1832 by the famous artist George Catlin (1796-1872). The brave is wearing a blanket robe trimmed with fur and bedecked with wristbands, necklaces and earrings. An arrow quiver is carried across his back. 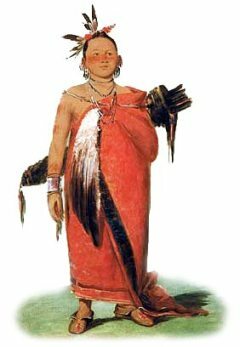 The proud young chief wore striking horizontal stripe of red face paint and wore a roach headdress decorated with eagle feathers. What was the lifestyle and culture of the Ponca tribe? The name, Ponka, was used by other Native Indian tribes to mean "Head Cutters" which reflected the Ponca custom, also shared by the Osage and Omaha tribes, of scalping and then decapitating their enemies. The many different tribes of the Great Plains developed sign language in order to communicate with each other and the sign to indicate a Ponca indicated this custom. Their original homelands were in Ohio where they lived in small longhouse villages and raised crops of maize, beans and squash. The first encounters with Europeans were with fur traders. With the introduction of the horse in the 1750's they migrated to the Great Plains, in the modern states of south Dakota and Nebraska, to hunt buffalo. This complete change of habitat led their adoption of the nomadic lifestyle of the Plains Indians. The encroachment of the lands resulted in the Ponca being forcibly moved to a reservation in Oklahoma and the tragic story of Chief Standing Bear. Where did the Ponca tribe live? The Ponca are people of the Great Plains Native American cultural group. The geography of the region in which they lived dictated the lifestyle and culture of the Ponca tribe. The American Great Plains region mainly extended across the present-day states of Iowa, Kansas, Minnesota, Missouri, Nebraska, North Dakota and South Dakota. What did the Ponca tribe live in? The Ponca tribe originally lived in small fortified villages of thatched bark longhouses. When the tribe migrated to the Great Plains they adopted the tepee as a convenient, temporary shelter for summer hunting trips. They also built earth lodges, similar to those built by the Pawnee. What language did the Ponca tribe speak? The Ponca tribe spoke the Dhegihan dialect of the Siouan language, closely related linguistically to the Omaha tribe. What food did the Ponca tribe eat? The food that the Ponca tribe ate included ate included fish and meat. Buffalo, deer (venison), black bear, elk and wild turkey. Their food was supplemented with wild vegetables and roots such as spinach, prairie turnips and potatoes and flavored with wild herbs. Food in the form of dried buffalo meat called pemmican was stored for use when food was scarce. What weapons did the Ponca use? The weapons used included bows and arrows, lances, stone ball clubs, hatchet axes, spears, and knives. Painted war shields were used when riding on horseback as a means of defence. What clothes did the Ponca men wear? The men of the tribe included buckskin tunics and leggings or breechcloths in the warmer weather. Warm buffalo robes or cloaks were also worn to protect against the rain and the cold. The men wore sandals or moccasins, a soft, light beige, slip-on shoe, consisting of a sole and sides made of one piece of leather. Roach headdresses adorned their heads. What clothes did the Ponca women wear? The women of the tribe wore knee-length dresses and leggings and buffalo robes during bad weather. The clothes of both men and women were adorned with ornaments, especially necklaces, wrist bands and earrings. Ponca History: What happened to the Ponca tribe? The following Ponca history timeline details facts, dates and famous landmarks of the people. The Ponca timeline explains what happened to the people of their tribe. 1789: French fur trader Juan Baptiste Munier established a trading post and was granted an exclusive license to trade with the Ponca at the mouth of the Niobrara River. 1875: Chief Standing Bear and some members of the tribe accompanied by Indian agents visit Oklahoma, but find the land inhabitable. The Ponca's are forced to walk 500 miles home. Today there are Ponca reservations in both Oklahoma and Nebraska. Many Ponca people returned to their native homelands on the Niobrara River.